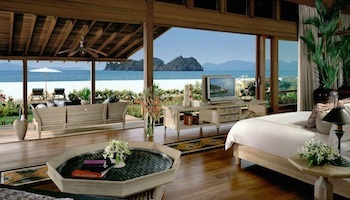 Malaysia offers two very distinct experiences: the peninsula and Borneo (an island shared with Indonesia and Brunei). The peninsula or West Malaysia is a mix of Malay, Chinese and Indian flavors with an efficient and modern capital, Kuala Lumpur. Malaysian Borneo features some of the most interesting places in Malaysia with a wild jungle, orangutans, granite peaks and remote tribes. 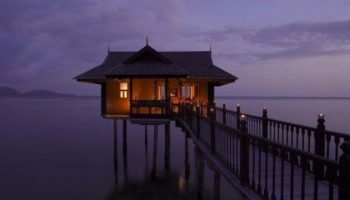 Combined with some beautiful islands, luxury resorts and colonials towns, Malaysia, for most visitors, presents a happy mix. 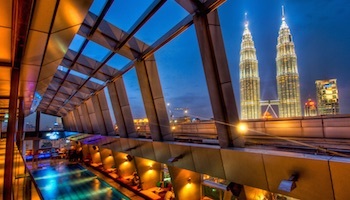 Almost 2 million foreign tourists traveled to Malaysia in 2010. Most of them were citizens from neighboring countries such as Singapore and Indonesia but a growing number of other foreign tourists are discovering this country as well. Here’s a look at the top Malaysia tourist attractions. Wannabe botanists likely will enjoy a visit to Gunung Gading National Park where the world’s largest flower grows. Rafflesia blooms can grow up to three feet in diameter, and have a nasty smell. The blooms die after a few days; the good news is they can bloom anytime of the year, though the best time is November through January. But there’s more to see than just one flower. The Sarawak park has nice beaches, rugged mountains and jungles just made for hiking. Water activities shine at Manukan Island, the second largest island in Tunku Abdul National Park, Malaysia’s first marine national park. Located in eastern Malaysia’s Sabah state, the park is known for its great beaches – the best beach is at the island’s eastern end. Travelers also will find coral reefs offshore that offer some pretty spectacular scuba diving and snorkeling. Manukan Island has the most developed tourist facilities of the five islands in the park, and is accessible by ferry from Kota Kinabalu. As temples go, Kek Lok Si Temple at Penang is a relatively new temple, dating back only to 1891. Despite its youth, it is one of the most important Chinese Buddhist temples in Southeast Asia. The Temple of Supreme Bliss, as it’s also known as, is an impressive sight, with countless images of Buddha another Buddhist icons and gods. It is the largest Buddhist temple in Malaysia and draws pilgrims from throughout Southeast Asia. The main highlight of the complex is the Temple of Rama IV with its 10,000 Buddha carvings. Travelers who make their way to Batu Caves near Kuala Lumpur will be rewarded with some pretty awesome Hindu art. The three main caves that make up Batu Caves make it the most popular Hindu shrine outside of India, and attract thousands of worshippers at Thaipusam, an annual Hindu festival. The highlight of the site is a giant statue of a Hindu god, reached by climbing 272 steps to the Cathedral Cave. Monkeys also enjoy the site and can be seen playing there. 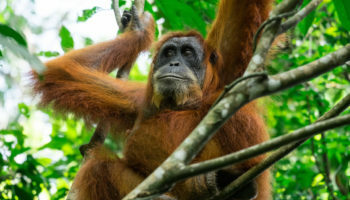 The Semenggoh Nature Reserve is famous for its orangutan orientation program in which orphaned or rescued orangutans are taught to live in the wild. Because of this, the surrounding forests have a thriving population of orangutans that are breeding in the wild. The best time to see the orangutans are the morning and afternoon feeding sessions. The Semenggoh Nature Reserve Also has a thriving bird population with colorful exotic Malaysian birds, including the Bornean black magpie, yellow rumpled flowerpecker, Malaysian honeyguide and brown hawk owl. Travelers can take a trip into the past with a ride on a 1900s steam train, the North Borneo Railway. The only train on Borneo, this old-fashioned train chugs about 83 miles from Tanjung Aru to Papar. Riding this train is a good way to see local villages with houses built on stilts and rice paddies being worked with water buffalo. Travelers enjoy Asian and Continental cuisine meals as they journey in one of five restored carriages. The train only runs on Wednesday and Saturday. Travelers who like to stop ‘til they drop will have a field day at Bukit Bintang, Kuala Lumpur’s main shopping district. Bukit Bintang has several malls, including Benaya Times Square, one of the largest malls in the world. This mall houses an indoor theme park. The district is filled with upscale malls and malls that specialize in electronics. 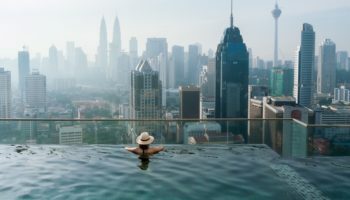 After a day of shopping, visitors can unwind at a sidewalk café or nightclub, since Bukit Bintang also is Kuala Lumpur’s trendiest entertainment district. Redang Island is made for beach lovers, with its white sand beaches and crystal clear ocean water, making it popular with snorkelers – great snorkeling is the island’s main attraction. Scuba divers love it here, too. 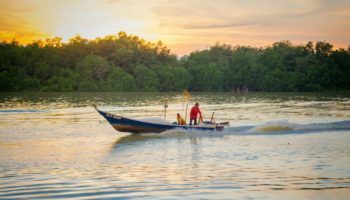 Though it’s one of the largest islands off the eastern Malay Peninsula, it’s small enough that visitors can get around on foot, either on roads or trekking through the jungle. Redang Island is one of nine islands in a marine nature reserve. 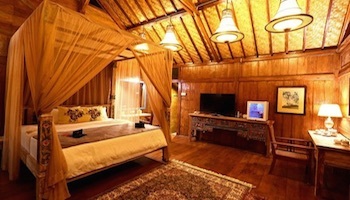 Accommodations are mostly resort style. Bako National Park is a popular tourist attraction in Malaysia for travelers who enjoy the great outdoors. Located in Sarawak state on Borneo, it’s not very big but packs a wallop for its size. Travelers can see wildlife, rainforests, tumbling waterfalls, beaches and sea stacks. 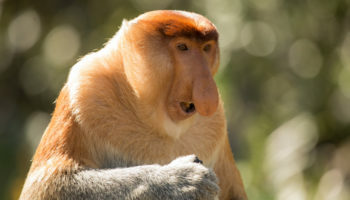 The biggest attraction in the park is the bizarre, obscene-nosed proboscis monkey, though they are rare and difficult to spot. It also has great nature trails, from easy strolls to full-day hikes through the jungle, so all visitors should be able to find one that suits them. Christ Church is a landmark in Melaka. Built by the Dutch in the mid-18th century, it is the oldest functioning Protestant church in Malaysia. Built in typical 18th century Dutch architectural style, the building is noted not only for its colorful façade but for its contents, too. Among them are a bell cast in 1698; tombstones, written in Portuguese that are incorporated into the church floor, and a brass Bible stand. It is now an Anglican church. Kinabatangan River is the second longest river in Malaysia, stretching nearly 550 km (350 miles) from the mountains to Sulu Sea. Located in Sabah state on Borneo, the Kinabatangan River is known for its diverse wildlife and vegetation. It’s a good place to see Asian elephants, crocodiles, proboscis monkeys and Bornean orangutans – it’s one of two places in the world to find 10 species of primates, as well as 200 bird species. It’s known, too, for rain- and limestone forests, and salt and freshwater swamps. Sipadan, in the Celebes Sea, is a diver’s paradise. Malaysia’s only oceanic island, Sipadan was formed by living coral atop an extinct volcano cone. Because of rich marine life, it’s one of the best diving spots in the world. Sipadan has more than 3,000 species of fish and hundreds of different corals, all waiting to be explored. Divers may come across hawksbill and green turtles, manta rays, schools of barracudas and whale sharks. The island also has nice sandy beaches. The Cameron Highlands is one of Malaysia’s most extensive hill stations, first developed by the British in the 1920s. It has a population of more than 34,000 people consisting of Malays, Chinese, Indians and other ethnic groups. The Cameron Highlands is renowned for its trails. They lead visitors through the forest to waterfalls and other tranquil spots. Apart from its jungle walks, the sanctuary is also known for its tea plantations and visitors can book several “tea factory” tours. Named after Britain’s King George III, Georgetown is located on the north-east corner of Penang Island. Most of George Town’s population is of Chinese origin. Due to strict controls, George Town retains many of its colonial-era shophouses to this day. 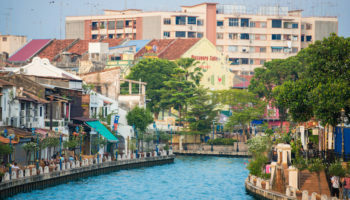 It is officially recognized as having a unique architectural and cultural townscape without parallel anywhere in Southeast Asia. The town truly springs to life in the evenings, when most of the locals head to the nearby street hawkers to have their meals and drinks. Taman Negara, which literally means “national park” in Malay, is one of the oldest tropical rain forest in the world. It features massive trees, waterfalls, jungle treks of various duration and the world’s longest canopy walkways. Several trails enable the visitor to explore the forest without a guide. Taman Negara is a haven for endangered species such as the Asian elephant, tigers, leopards and rhinos, but numbers are low and sightings are very rare. It’s unlikely that you will see anything more than birds, small deer, lizards, snakes and perhaps a tapir. Tioman is a small island located off the east coast of peninsular Malaysia. In the 1970s, Time Magazine selected Tioman as one of the world’s most beautiful islands. Tourists have surged to the island ever since, seeking a taste of paradises. The island is surrounded by numerous white coral reefs, making it a haven for scuba divers while the interior is densely forested. Visitors outnumber villagers outside the monsoon (November to February), but Tioman can be virtually deserted at other times. 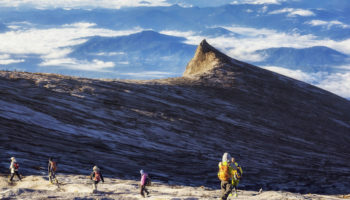 With a summit height at 4,095 meters (13,435 ft), Mount Kinabalu is the highest mountain in Borneo. The mountain is known worldwide for its tremendous botanical and biological species biodiversity. Over 600 species of ferns, 326 species of birds, and 100 mammalian species have been identified at Mount Kinabalu and its surrounding. The main peak of the mountain can be climbed easily by a person with a good physical condition, and requires no mountaineering equipment although climbers must be accompanied by guides at all times. The Petronas Twin Towers in Kuala Lumpur were the world’s tallest buildings before being surpassed in 2004 by Taipei 101. However, the towers are still the tallest twin buildings in the world. The 88-floor towers are constructed largely of reinforced concrete, with a steel and glass facade designed to resemble motifs found in Islamic art, a reflection of Malaysia’s Muslim religion. The Petronas Twin Towers feature a sky bridge between the two towers on the 41st and 42nd floors. 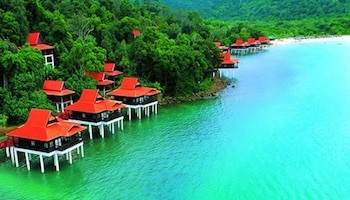 Malaysia’s best-known holiday destination, Langkawi is an archipelago of 99 islands in the Andaman Sea. The islands are a part of the state of Kedah, which is adjacent to the Thai border. By far the largest of the islands is the eponymous Pulau Langkawi with a population of about 65,000, the only other inhabited island being nearby Pulau Tuba. Fringed with long, white beaches and with an interior of jungle covered hills and craggy mountain peaks, it’s easy to see why this is Malaysia’s most heavily promoted tourist destination. The most popular beaches can be found on the west coast with a wide choice of restaurants and eateries and some of the best resorts in Langkawi. Located off the coast of northeastern Malaysia not far from the Thai border. The Perhentian Islands are the must-go place in Malaysia for budget travelers. They have some of the world’s most beautiful beaches and great diving with plenty of cheap accommodation. The two main islands are Perhentian Besar (“Big Perhentian”) and Perhentian Kecil (“Small Perhentian”). Both the islands have palm-fringed white sandy beaches and turquoise blue sea. Sepilok Orang Utan Rehabilitation opened in 1964 for rescued orphaned baby orangutans from logging sites, plantations and illegal hunting. The orphaned orangutans are trained to survive again in the wild and are released as soon as they are ready. The Orang Utan sanctuary is located within the Kabili-Sepilok Forest Reserve, much of which is virgin rainforest. About 60 to 80 orangutans are living free in the reserve. It is one of Sabah’s top tourist attractions and a great stopover on any Malaysia itinerary. Which attractions in Malaysia do you consider to be the most interesting? Malacca, the melting pot & historic “New York City of the 14th century” is missing. Malacca….is where it all begun in Malaysia…world heritage site, good food, culture, legacies, Dutch, Portuguese, Chinese, Indian remnants should definetly be among the Top 10. The other spot should go Kinabatangan in Sandakan, Sabah Borneo. Superb ecotourism spot & one of the best in Asia where you are likely to spot wildlife like the endangered orang utans, pygmy monkeys, darters & hornbills. Pulau Sipadan in Borneo Sabah is also missing?? I have visited Malaysia (KL) twice already. The first time, I visited our head office in Rawang and the second time with my wife and son. Malaysia is such a nice place where people are friendly and hospitable. I love visiting the twin tower and the Hindu Cave. Hope I find time to visit the place for the third time with my wife and 2 sons. I have visited Malaysia once with my wife and another friend alongwith his family. I was very much impressed the way Airport at KL is maintained. The hospitality and friendly behaviour at the hotel where we stayed. I am 65 years old. If I got a chance to travel outside my country Malaysia will be my first choice. I always cherish the memories of those 5 days when I stayed at Kuala Lumpur and visited Twin Towers and Hindu Temple and caves thereat.. Hope I find time to visit the place for the third time with my wife and 2 sons. Thank you for nice and intresting informetion about malasiya. I would like to advice the traveler to Malaysia to be Extra Careful about the Scams and Cheating, which I have experienced. Otherwise, I have no complain about Malaysia, its a beautiful country, that’s why I went there three times !!! Breathtaking images! I wish to visit Malaysia but I couldn’t spend more than 3 days. Which among these should I visit with my limited time? I can spend only 5 days, so which will be the best place for me? cameron highlands was so great. Thanks for the useful information, I needed this to prepare for my next trip there. Cameron highland is still the Best! Batu Caves is best for me. Have been there with my family, several times. It still feels refreshing. Want to go Serawak after this.